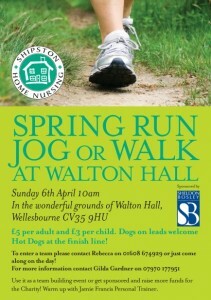 APRIL 6TH is our date this year for the Spring Walk at Walton Hall. Covering 6 miles through fields, forest and on road, suitable for all abilities. This year we’d love to see more business, clubs and groups who’ll get together and bring a team to the walk. Get a sponsorship competition going in the office and help us raise more money for this really worthwhile charity.